Isuzu is one of many 4WD SUV manufacturers. One of the differences is that Isuzu is a Japanese automaker. Another difference is that the 3.2L V6 engine is included with the Rodeo. Not every automaker has a V6 and some have a V8 engine. The size of the engine definitely matters when you are replacing the transfer case. In our inventory, you will find a low cost Isuzu Rodeo transfer case that will fit perfectly. This drive train unit is in used condition and we guarantee that it will exceed your transfer case expectations. A four-wheel drive vehicle is very different from a plain old 4-cylinder. 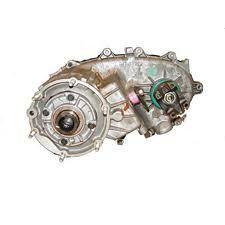 The transfer case works in conjunction with the motor and with the transmission. These 3 units must be working at top condition or problems happen. Getting your hands on Japanese produced auto parts can be tricky. It does take the help of a wholesaler or other importer to help you. To save you the expense and hassle, we have taken care of the importing for you. We unload containers full of Isuzu transfer cases inside of our warehouse. It is from this used inventory that we hand select the units that will be sold to our customers in the U.S. The GM Vortec motor is what was used in the Rodeo. This partnership with General Motors means a lot to the transfer case you select. There are differences in the gear ratios. Buying an aftermarket transfer case could doom the engine and transmission in your Rodeo. You must be precise when ordering the right part. We have personally heard horror stories told to us by new customers that moved over to us from a competitor. Things like wrong parts showing up, non-educated sales staff and lengthy shipping delays can cause all sorts of issues. We take care of the customers that ask us questions or purchase one of our components. We work hard to ensure their vehicle is working in top condition. The Isuzu brand is known worldwide. This does make it possible for you to buy something on eBay if you choose to do so. We let all customers decide what is best for their 4×4. We can only provide accurate information and work hard to earn the business of new customers. We work with established dealerships, salvage yards, mechanics and others that install or sell transfer cases regularly. We win over the business of these professionals with our expert sales staff and flawless transfer cases for sale. What we sell are cleaned and prepared cases that are immediately ready for install. It takes just a quick moment to get a great price from our company. Take a look at our quote form. Do you see how easy it is to use. All you do is make two clicks of your mouse and you’re finished. Your quote is displayed and you will find that we offer free shipping. Let our experts help you over the phone at (888)-508-7153 . Get the price you need immediately.